Nature's Science CHIA & HEMP OIL™ is made with cold-pressed chia and hemp oil and provides a natural source of omega 3, 6 and 9. WHY CHIA & HEMPSEED OIL? 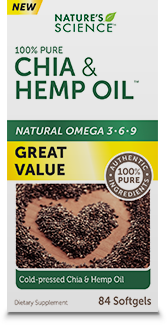 Nature's Science CHIA & HEMP OIL contains approximate 1:1 ratio of omega-3 to omega-6 along with omega-9, thus providing a wide spectrum of omega fatty acid support. Nature’s Science CHIA & HEMP OIL contains pure, premium, virgin natural chia and hemp seed oil.